tall man wearing hat is Lieutenant George Stoner. Miscellaneous shots of Mortell dusting for prints in cab. Bullet in hand -- bullet found in cab. 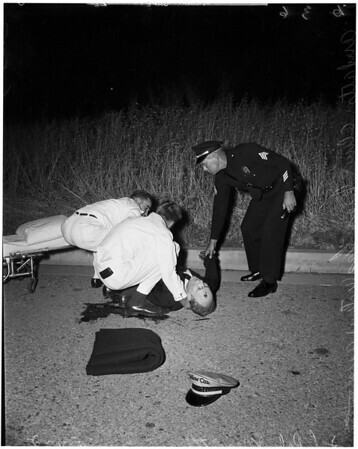 G15: Sergeant Merritt looks over body as ambulance men work over victim. G14: Lieutenant Nicholis Janise counts change found at scene, cabbies hat in foreground".